LatinaLista — Since 1919, an official time has been set aside to celebrate children’s books. This week marks the 94th anniversary of Children’s Book Week, (May 13-17). The week is highlighted by a variety of literacy activities and readings held in over 50 cities. It’s also the time that young readers learn which of their favorite authors and books won the national children’s and teen choice book awards, which were voted upon by the young readers themselves. The winners of this year’s book awards were voted from the 2013 finalists. A quick review of the authors and titles of this year’s finalists don’t reflect too much diversity and it serves as a stark reminder that more authors of color need to be included in reading lists across the country. Since the primary goal of Children’s Book Week is getting kids to read, it makes sense that children who are reluctant readers would more readily gravitate towards books where the stories reflect their lives or to characters who look like them. From there, it’s a natural move to books that feature topics that are of interest to them — but there has to be a starting point. 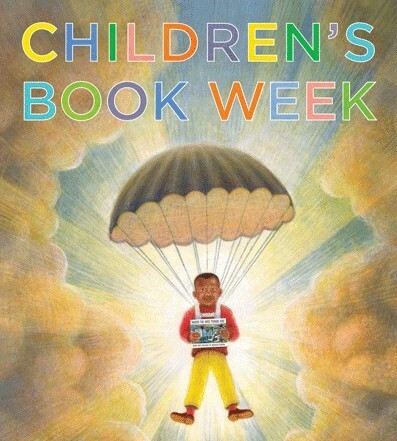 This year’s Children’s Book Week’s official poster reflects the fact that books should be able to take the reader anywhere. That is the magic of books but the wonder of stories is that children, and teens, can take that trip believing it’s all possible for kids like them.